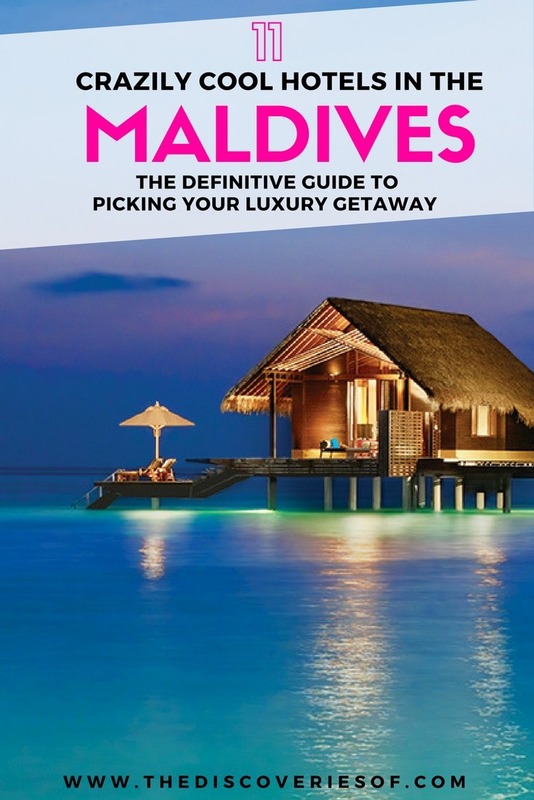 Maldives Resorts 2019: The Definitive Guide – The Discoveries Of. 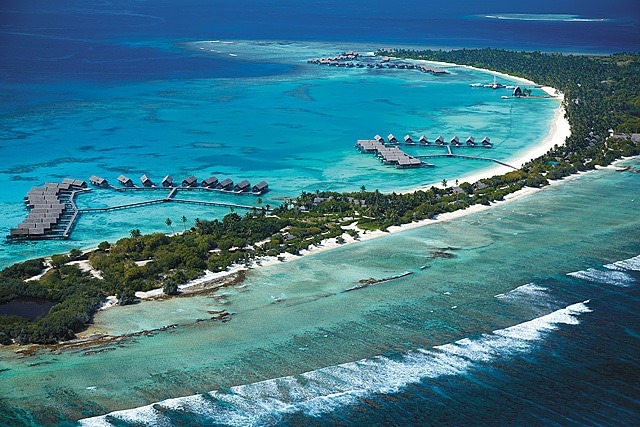 When it comes to Maldives resorts, visitors are spoilt for choice. So much so that it can be difficult to pick one. Here’s my definitive guide to the best luxury hotels in the Maldives for your getaway to paradise. So you’re thinking (or dreaming) of heading to the Maldives? You’re in for the trip of a lifetime… crystal clear waters, incredible views, food, spas and watersports. I wish I were back there. 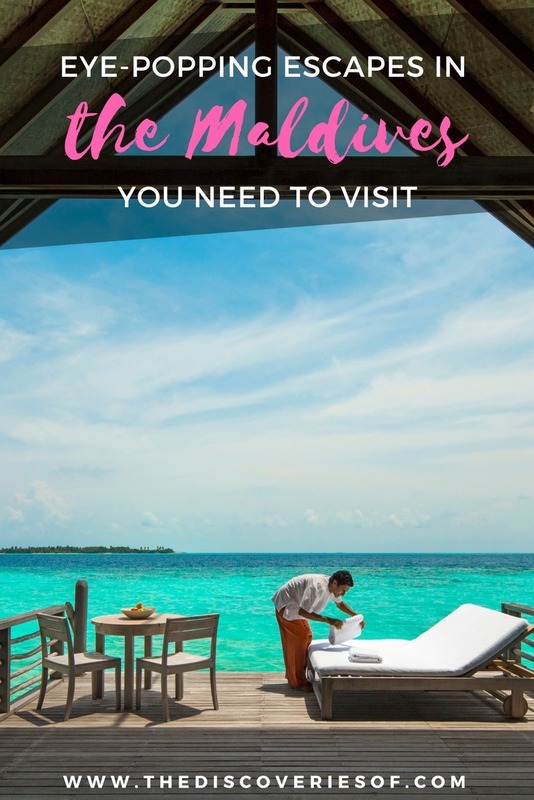 Check out my full guide to the best Maldives resorts for 2019 to help you plan the perfect trip. So which is the best of the best? The Best Maldives Resort of 2019 is the absolutely gorgeous Amilla Fushi, thanks to its contemporary-luxe feel and decadent spa. It’s a tough decision – there’s no shortage of high-end, super-luxury hotels in the Maldives and, of course, each comes with THOSE views but the Amilla experience is a step beyond paradise. Hurawalhi Island Resort might be one of the newest Maldives resorts, but it’s already established itself as one of the best. The 90 villas on this private island resort all come with breathtaking ocean or beach views. Adults-only barefoot luxe is the name of the game, and Hurawalhi plays it very well. Guests can choose from an s Ofexpansive range of activities from diving to deep-sea fishing, windsurfing and jet-skiing. One of Hurawalhi’s biggest draws (along with the picture-perfect beaches and paradise views that are de rigeur in the archipelago) is 5.8 – the world’s largest all-glass undersea restaurant. Where else can you dine 5.8 metres under the sea? It’s hard to focus on the (stellar) food when there’s a never-ending marine view stealing the show. It’s difficult to believe it now, but Baros Maldives was only the third Maldives resort when it opened in 1973. This small coral island is ringed with a sandy beach and comes with its own house reef mere metres off the coastline. Baros holds a long-standing reputation as the home of laid-back chic in the Maldives. This island resort has maintained its skilled combination of friendly hospitality in a luxurious setting throughout the decades. 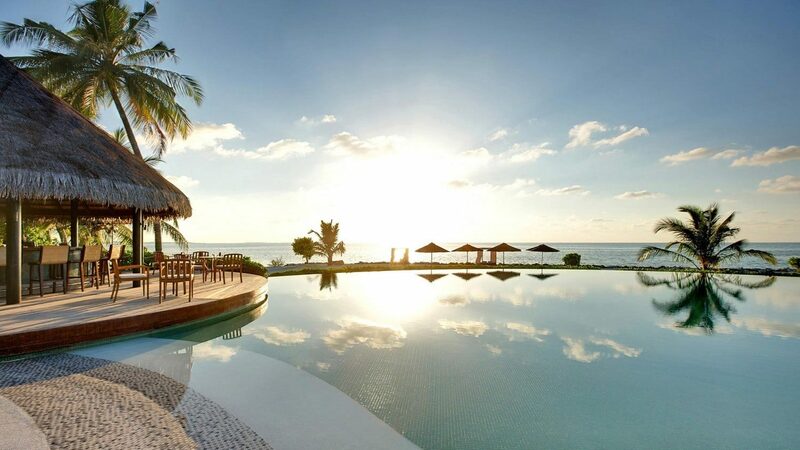 The award-winning hotel is also at the forefront of eco-conservation in the Maldives. Guests transfer to Male via speedboat, meaning that you can touch down and be in your private villa in a matter of moments. Rooms are spacious and elegantly furnished to complement the surroundings – they incorporate many of the area’s natural materials. If you can tear yourself away from yours, take some time to indulge in a treatment or two at the wonderful spa. Alternatively, opt for something more active with a spell underwater at one of the 30 dive sites in proximity to the hotel. Nestled within the Noonu Atoll, Velaa Private Island describes itself as a “beyond luxury” boutique hotel in the Maldives. Velaa is privately owned by Czech billionaire Jiri Smejc, whose vision to create a property catering to the travel elite has been realised through Velaa. He set out to create a property that stood out from other Maldives resorts and that he certainly has. The island only features 47 villas, houses and residences, in addition to four four bedroom residences. All the accommodation boasts jaw-dropping views and comes with a private butler. Guests can do as much or as little as they would wish – the spa is excellent (of course), but its features such as a climbing wall, golf academy and squash and tennis courts that set Velaa apart. Award-winning architect Petr Kolar has created the ultimate luxury island escape. Decor-wise, there are no gold taps or flashy accessories: the focus at Velaa is in using the very best quality materials to create a pared-back, high-end aesthetic. Niyama offers a unique take on the traditional Maldives resort in 2019 with its offer of two island resorts: Play and Chill. The two islands are connected by a bridge but, as the names suggest, have different focuses. Play is tailored to those who like their island getaways with an added touch of adventure. While many hotels focus on adult-only guests, Play is the perfect destination for those with young families – the Explorers Kids Club entertains kids from 12 months up to 12 years, leaving parents free to indulge in a bit of solitary island-time. Chill is much more laid back, so it’s fitting that it’s also home to Niyama’s LIME Spa. 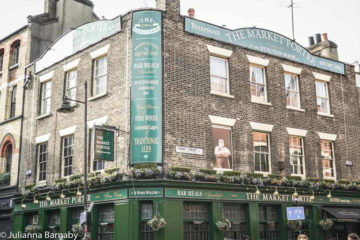 This is generally where those on honeymoon and other big folk stay to catch up on serious rest and relaxation time. Whichever island you decide to go for, all guests are looked after by a personal Thakuru, or butler. 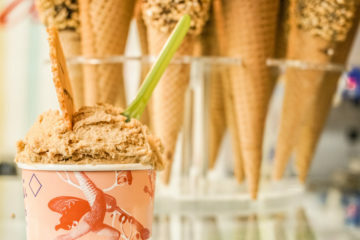 Rooms come with mini-bar stocked with numerous treats including complimentary popcorn and ice cream. 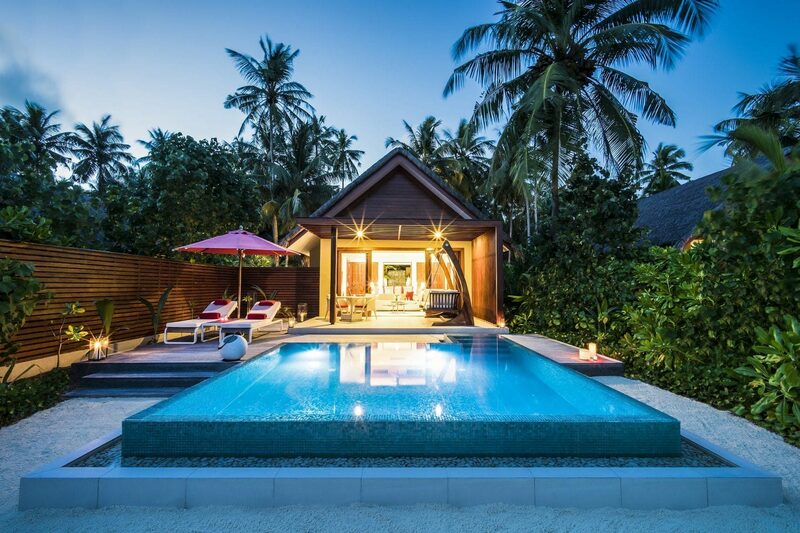 Lux* South Ari Atoll is set against the picture-perfect backdrop of Dhidhoofinolhu island. The hotel offers guests a barefoot luxe experience through the beach house chic property. The recent renovation has made the already stylish property a cut above. With 193 villas, Lux is one of the larger Maldives resorts on this list, but excels at creating an intimate experience for each guest. The larger size of the resort means that there’s plenty of choice when it comes to dining – take your pick from one of the eight restaurants. There are also five bars. Work your way through them to decide which is best for sundowners. Choose between sunrise or sunset villas – either way, you are guaranteed the glorious colours that the Maldives is famous for. The Four Seasons brand is synonymous with luxury worldwide, even so, the Four Seasons Maldives stands out from the crowd. Where else offers guests a choice of two hotels, live-aboard cruises or, for the ultimate Robinson Crusoe experience, a stay on a private island? 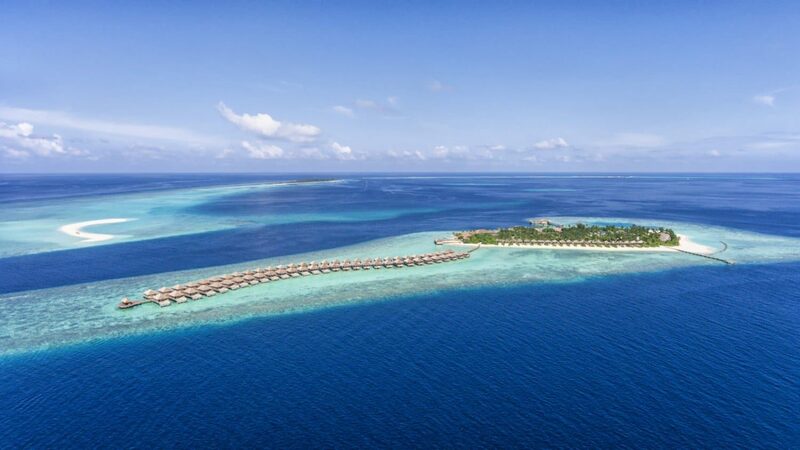 The two Four Seasons Maldives resorts, Kuda Hari and Landaa Giraavaru are miles apart. Kuda Hari is a 25-minute speedboat ride from Male airport, while Landaa is a 45-minute seaplane flight. Both personify get-away-from-it-all charm and crystal waters. Marine lovers should consider the Four Seasons Explorer – a three-deck catamaran that sets out for 3- 4- and 7-night excursions. It sails between the two resorts and is also available for private charter. Those looking to go all out can hire out Four Seasons Private Island Maldives at Voavah, Baa Atoll. Voavah opened in December 2016 as an exclusive-use island escape in a UNESCO World Biosphere Reserve. Guests are treated to Four Seasons service, with use of a private yacht, a dedicated dive centre, beach house and other luxuries for the duration of their stay. Looking for a different Four Seasons experience? Read my review of the Four Seasons Hotel Ritz Lisbon. Maldives island resort, Soneva Fushi is the laid-back playscape for adult adventurers. Tucked away in the Baa Atoll on Kunfunadhoo island, the resort is a 30-minute seaplane ride from Male. The hotel defines itself by the simple concept of “No news, no shoes”. Soneva offers its guests the perfect place to switch off and experience the glorious views, water and adventures of the Maldives. Soneva’s 56 villas are set on a stretch of pristine, white sand beach. Each one comes with a private garden and open-air bathroom. It’s no wonder guests have a hard time leaving them throughout their stay. 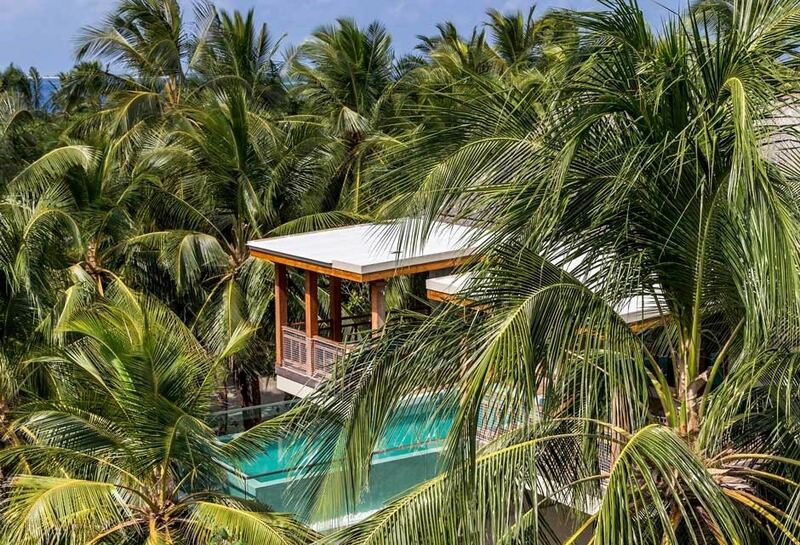 You should also check out Soneva Fushi’s newly-opened sister property Soneva Jani in Noonu Atoll. 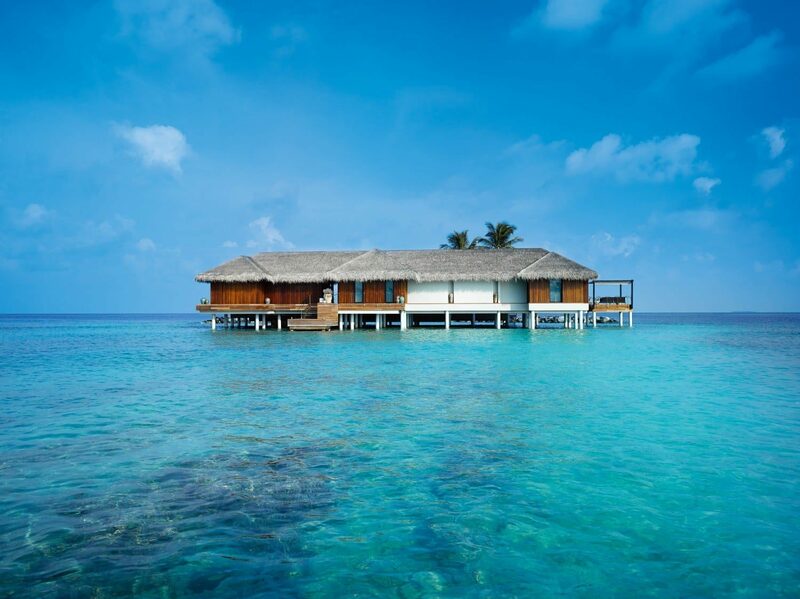 The small resort features 25 exclusive villas set in a 5.6km lagoon. COMO Cocoa Island has been luring international travellers to bed down and escape from it all since it opened in 2002. Located a 40-minute speedboat ride on Makunufushi in the southern atolls, Cocoa Island is a peaceful retreat welcoming to all. Stylish Indian Ocean chic is the order of the day at this quiet and calm Maldives resort. Villas are simply decorated with crisp linens and natural materials for a contemporary look. The resort also features COMOs signature spa brand, COMO Shambhala Retreat. They host a range of wellness programmes, or guests can create their own spa packages with the expansive spa treatment menu and yoga classes. Amilla Fushi’s stark and futuristic design stands in stark contrast to the barefoot luxe aesthetic predominant in the Maldives’ luxury resorts. The result is a hotel that wouldn’t look out of place in Miami or St Tropez. Think striking white walls, cocoon tubs and cantilevered suspended pools and you’re on the right track. Amilla offers a range of accommodation options. 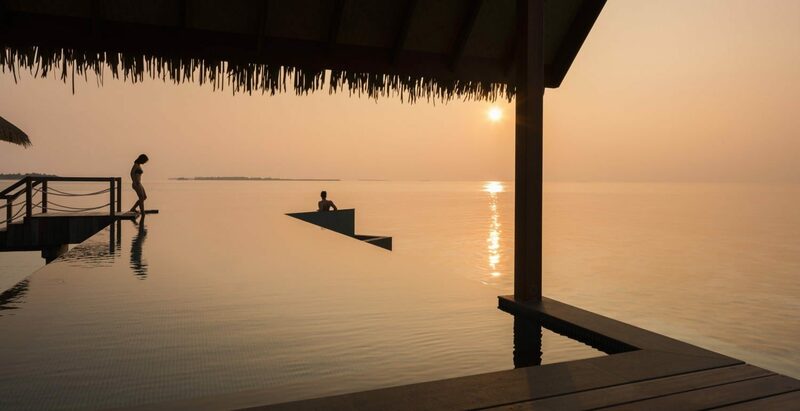 There are the more traditional over-water villas and beach houses, each with a slightly different layout and amenities to suit different guests. Not so standard are Amilla’s treehouses. Set in the midst of tropical palms and greenery, the treehouses’ stunning infinity pools overlook the tree canopy. Undertake a digital detox – you couldn’t ask for a better setting. As I mentioned above, Amilla is my pick of Maldives resorts for 2019 thanks to its unique take on a luxury island property. Plus the Instagram opportunities are out of this world. 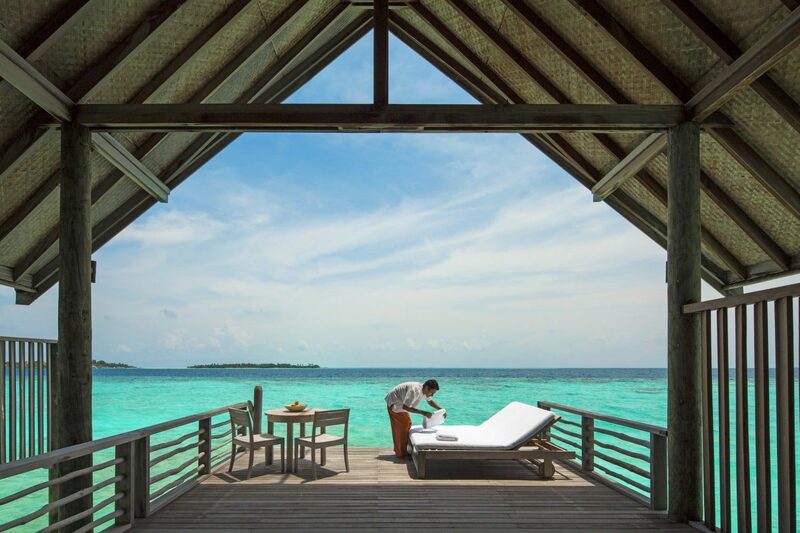 The One & Only Reethi Rah is the Maldivian outpost of ultra-luxe brand One & Only Resorts. This 128-villa luxury resort features some of the largest villas in the Maldives and a whopping 12 beaches dotted across the island. The wood and thatch villas are elegantly designed, larger than most London homes and come with personal butler service. 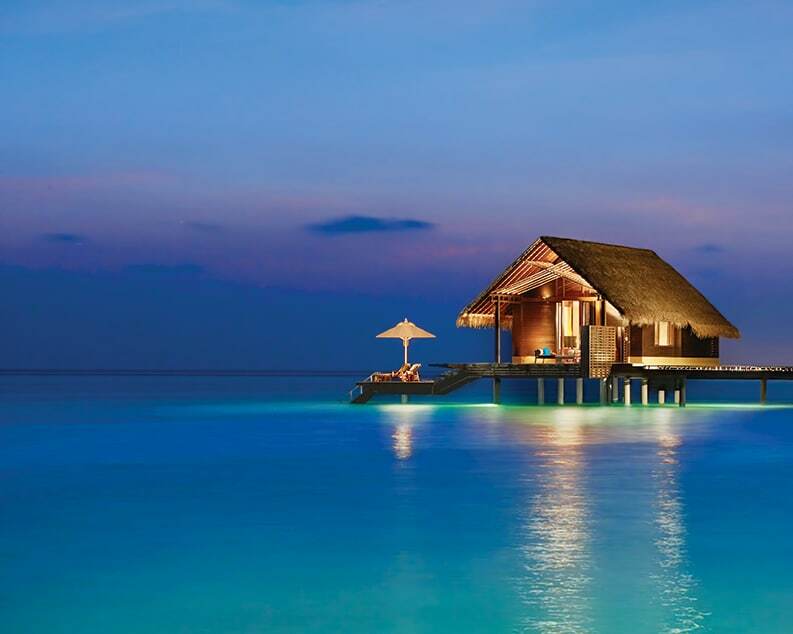 Based on the Maldives’ largest island, Reethi Rah is a memorable destination. 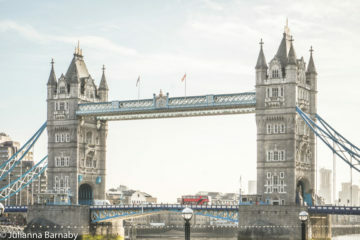 The hotel has its own time zone (an hour ahead of Male) to guarantee the maximum number of daylight hours and goes out of its way to ensure that every guest feels as pampered and cosseted as possible. There’s no detail too small or ask too big for them to cater to. They’ll happily pop a bottle of champagne on the beach or send a private golf-buggy to transport you around the island without ruining your pedicure. Read about the classic over-water villa resort, Pangkor Laut in Malaysia. Shangri La’s Villingi Resort & Spa opened in 2008 and has been wowing visitors ever since. The luxury brand has gone all out on their Maldives resort hotel and the result is notable. Villingi resides on one of the Maldives’ largest islands, with the result that the resort feels spacious and secluded, despite the fact there are over 130 villas. Villas boast ultra-modern facilities, with huge bathtubs, indoor and outdoor showers and complimentary Nespresso coffee machines. There are the usual watersports facilities, dive centre and gym to keep guests entertained. The nine-hole golf course is the only one in the Maldives – a draw for those looking to work on their swing. The resort also features Shangri La’s signature spa brand, CHI. Choose from a decadent range of treatments to top off the island paradise experience. Need more holiday inspiration? Read more of The Discoveries Of’s luxury hotel reviews or check out our beach destination guides. Don’t forget to check out my ultimate tropical vacation packing list to make sure you don’t miss anything for the trip! All of these look amazing! So glad that you like them. It was a difficult choice! Oooh interesting Sid. I’m not sure I can pick a favourite but Velaa is wonderful! They do don’t they. Such beautiful places. The only problem with them is you never want to go home. It is so beautiful that it doesn’t even look real! 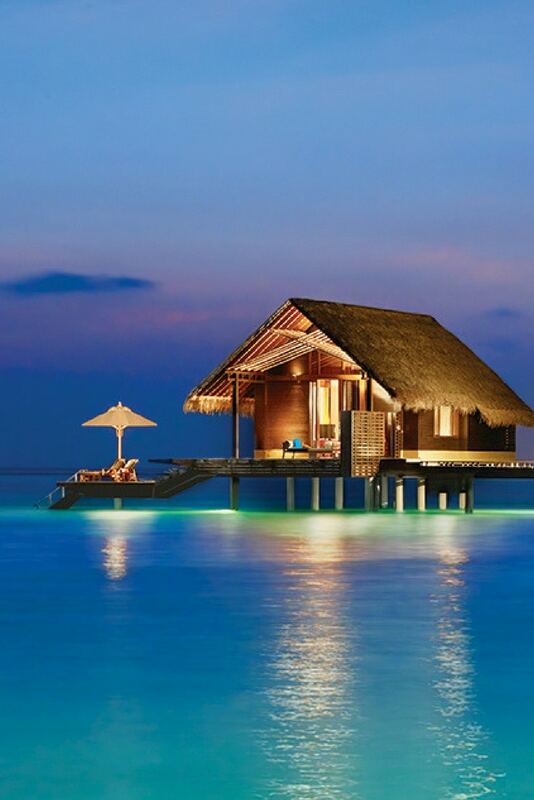 I think I would go the Niyama! They don’t do they – such a big fan of all of these resorts. Some really stunning places making it hard to pick a favourite. Pretty much any Maldives location i would holiday. Thanks for your share. Thanks Tony, it’s hard to pick a location for sure. We loved the small cruise ship the Atoll explorer. Touring round the islands and diving and seeing the manta rays. They all look amazing. We were considering 2 weeks with 2 different islands. Good idea and if so your suggestions please? Hey Sandra – two weeks on two different islands is a great idea. You just need to check the transfers between the islands as it can be difficult/ very expensive travelling between them (rather than flying or taking a boat from Male). I think it’s a tough call to choose two to suggest as it would completely depend on what you’re looking for. 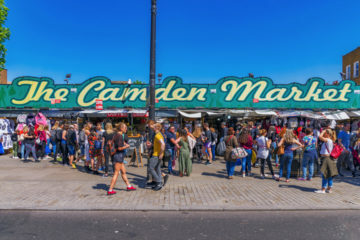 My suggestion would be to pick two that have a different focus – so perhaps one where there are stellar watersports or really high-quality dive outfits and another where the focus is the spa or cuisine. That way you can really appreciate the contrast and see two different sides to the Maldives. Enjoy!